This is the very first boss Link will encounter. His name may be hard to pronounce, but he is very easy to defeat. He is found in the very first level, the Woodfall Temple. You only have four to five hearts by then so don't expect a challenge. But the one thing about this boss, is that... well, he's huge. So huge that he needs an extra large boss room. This is a very different enemy that Link has ever faced, as you might have noticed. 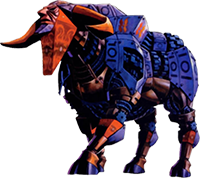 Goht is a giant mechanical bull, which tells you he must have a weak spot, for no machine is perfect (Yes, even the Majora's Mask cartridge). This is a pretty easy fight, if you know what your doing. 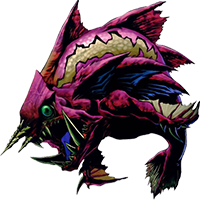 Gyorg is a mutant fish that is very powerful in his attack yet does not have a good defense mechanism. He is a good fight, but equally challenging for most players. His horn on his head is a deadly attack, so watch out. He is a take off of the fish boss in Link's Awakening, which proves that zelda recycles its used enemies. When you look at this boss, one thing comes to mind: Lanmolas, the sand monsters from the old zelda games. But, this boss is far from it. There are two creatures, as you can see, one stays in the soil, while the other flies around and attacks you. This boss cannot be defeated too easily. You must use the giant mask you found at the end of the temple to defeat it. Only when you use the giant mask here, Link will transform into a giant. You must fight Twinmold as the giant or you cannot defeat him. Could you really be fighting a mask? Well, why not? Although it starts out as a mask, it transforms into many different horrifying shapes. 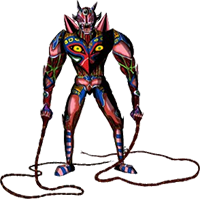 The mask has a wide variety of attacks, but once you transform into Oni-Link then you have nothing to worry about.